Why Defendant Former Employers Do Not Get Mirror-Image of Plaintiff’s Personal Computer. ≈ Comments Off on Why Defendant Former Employers Do Not Get Mirror-Image of Plaintiff’s Personal Computer. The Defendants in employment litigation sought the mirror imaging of the Plaintiff’s personal computers three years after she had been terminated. The crux of the eDiscovery centered on the former employee forwarding emails from her supervisors email to her personal account, which the Defendants claimed were lost by the Plaintiff. The Court denied the motion to compel. Downs v. Va. Health Sys., 2014 U.S. Dist. LEXIS 74415, 6-11 (W.D. Va. June 2, 2014). (5) On the current record that the defendants have failed to justify a broad, and frankly drastic, forensic computer examination of the plaintiff’s two family computers. Downs, at *9-10, referencing McCurdy Group v. Am. Biomedical Group, Inc., 9 Fed. Appx. 822, 831 (10th Cir. 2001); see also Basile Baumann Prost Cole & Assocs., Inc. v. BBP & Assocs. LLC, 2013 U.S. Dist. LEXIS 51264, *8 (D. Md. Apr. 9, 2013). . . .
Texas Bar Now Has Fastcase and Casemaker. ≈ Comments Off on Texas Bar Now Has Fastcase and Casemaker. As the saying goes, ’Everything’s bigger in Texas.’ That phrase also applies to the State Bar membership benefits. The State Bar of Texas has agreed to add Fastcase as a member benefit on top of its already existing Casemaker access. This makes it the first Bar in the country to offer both services. In addition to adding Fastcase, the State Bar of Texas increased the level of subscription to Casemaker to include the premium services of Casecheck+, CiteCheck, and CasemakerDigest to the member benefit. That is a major coup for the Bar. Fastcase’s access will depend upon the size of your firm. For those under 11 attorneys, you will have access to the premium Fastcase database (all states & fed), for those 11+ attorney firms, you will have access to the Texas plan. Everyone will have access to the mobile apps and to the HeinOnline integration for the covered material. It is a great day for the State Bar of Texas and its members. Read the Fastcase and SBOT press releases below for more information. To log in to this free benefit, members will visit the State Bar website at http://www.texasbar.com and log in with their bar number and password. The service is also available via the TexasBarCLE website at http://www.texasbarcle.com/. String Citations – Good or Bad Legal Writing Tool? ≈ Comments Off on String Citations – Good or Bad Legal Writing Tool? String citations – a good writing tool or a bad idea? Lengthy string citations, like long single-spaced block quotations, are never a good idea. Readers tend to skim or skip a big block of text. Your summary judgment brief contains eleven distinct legal propositions, including the standard to be applied in ruling on summary judgment. You have researched each, and have found multiple cases. You have read them and highlighted them and they are sitting on your desk in eleven stacks. You have even sorted each stack, moving the most persuasive authorities (because they are from your state and circuit, or are more recent, or are from higher courts) to the front. It is not so. String cites are a bad idea, for multiple reasons. . . .
PowerPoint Basics and Beyond for 2010, 2007, and 2003. ≈ Comments Off on PowerPoint Basics and Beyond for 2010, 2007, and 2003. Habits of Exceptionally Happy People. ≈ Comments Off on Habits of Exceptionally Happy People. And Now For Something Completely Different — Murphy’s Laws. ≈ Comments Off on And Now For Something Completely Different — Murphy’s Laws. Lots and Lots of Jury Instructions. ≈ Comments Off on Lots and Lots of Jury Instructions. Checked Your Readability Score Lately? ≈ Comments Off on Checked Your Readability Score Lately? Think you can write? Do these four things. First, pull out the last brief that you wrote. Second, click through this link, which will tell you how to enable Microsoft Word’s ‘readability’ feature on your computer. Enable that feature. Third, let the readability feature score your work. You didn’t notice the spit? Here it comes: Compare your readability score to the average readability score for the works of bestselling authors. I didn’t even know about Microsoft’s readability feature until I published a column on legal writing last month. I argued in favor of using short sentences and the active voice. A reader — Steve Dykstra, who’s a legal recruiter and budding novelist in Toronto — promptly sent me an enlightening email. Steve also subjected my work — my column on legal writing — to Microsoft Word’s readability test. Steve then told me how my column compared to the work of bestselling authors. . . . The U.S. Supreme Court’s Recent Cell Phone Ruling. ≈ Comments Off on The U.S. Supreme Court’s Recent Cell Phone Ruling. That Supreme Court ruling on cellphones was supposed to be reassuring. The government needs a warrant to search your phone, the court ruled. But read Riley vs. California more closely and it’s just a little scary — particularly for those who pay little attention to what’s on their smartphones. If you don’t think your phone exposes your life-all of it-take it from the nation’s highest court. Your phone, says the court, is your life. Cracking it open is even more revealing than rummaging through your home, which the Fourth Amendment’s protection against unreasonable searches was designed to protect. . . .
Brief Writing: The Table of Contents and Table of Authorities. ≈ Comments Off on Brief Writing: The Table of Contents and Table of Authorities. Sometimes, especially in law, it’s the little things that make all the difference. The cover page, Table of Contents and Table of Authorities are used for major briefs, such as briefs in support of dispositive or trial motions. Sometimes they are mandatory; other times they can be used to enhance a brief and make it easier for the court to read and understand. Regardless, all three of these tools are excellent methods for enhancing any lengthy or complex brief filed with the court, and paralegals should make sure they are familiar with all these tools. . . .
≈ Comments Off on Juries and Social Labeling. ‘Everyday is a great day!’ That’s what he said, and appeared to believe with every fiber of his body. He was a 20-something, male clerk in an airport hotel’s gift shop. My response to, ‘How are you today?’ paled in comparison. ‘Oh, alright,’ I said as I contemplated what was about to be a very long research day. I didn’t expect to have a philosophical discussion that morning, but after what he said, I couldn’t help but ask his secret. He looked so content, so convincing, so . . . what’s the word? Oh yeah, happy. So I asked, and his answer stuck with me. He said about five years earlier he found himself in a tough spot; he was making poor choices; he was unhappy and making others around him unhappy. He decided to change his life, and he would do it by simply declaring that every day was special, that ‘everyday is a great day!’ He said from that point on, his attitude changed and he noticed that others’ attitudes also changed. He found that when he’d tell people that, they smiled and seemed a bit lighter, less stressed. I felt the same – his answer had reminded me that I should be focusing on the positive; that I should be thankful to have a job that allows me to have interesting and challenging conversations nearly every day; that I should be looking forward to interacting with a whole new group of people – people who had important things to say and from whom I would learn a lot. In short, it really was about to be a great day, and I needed to change my attitude. I was reminded of this encounter during a recent jury selection. While I typically believe it’s somewhat of a waste of time to elicit ‘promises’ from your potential jurors (i.e., ‘Do you promise that you’ll give my client a fair shake?’ ‘Do you promise that you’ll follow all of the judge’s instructions?’ ‘Do you promise to not let your sympathies influence your decision?”), this attorney took a similar, but improved tack. His questions, and subsequent labeling of the jurors, utilized a well-researched phenomenon called ‘social labeling.’ . . .
How To Brief A Case. ≈ Comments Off on How To Brief A Case. Judge Posner Critique on Structuring Statutory-Interpretation Books. ≈ Comments Off on Judge Posner Critique on Structuring Statutory-Interpretation Books. [J]udge Richard Posner of the U.S. Court of Appeals for the Seventh Circuit delivered the Madison Lecture on Judicial Engagement at Columbia Law School. The lecture series, sponsored by the CLS chapter of the Federalist Society, brings distinguished jurists to Columbia to discuss topics relevant to the federal judiciary and the administration of justice. In his talk, entitled ’How I Interpret Statutes and the Constitution,’ Judge Posner was his usual candid self. He offered commentary on two recent books about statutory and constitutional interpretation — books that he’s not a fan of. Yes, readers. There will be benchslaps…. Reminder – Minnesota Court Rules Are A-Changing. ≈ Comments Off on Reminder – Minnesota Court Rules Are A-Changing. (Effective July 1, 2014) Supreme Court Promulgates Amendments to the Rules of Juvenile Protection Procedure and the Rules of Adoption Procedure. Bad Thinking = Bad Writing. Makes A Lot Of Sense. ≈ Comments Off on Bad Thinking = Bad Writing. Makes A Lot Of Sense. In a recent Chronicle of Higher Education article titled ‘Bad Writing and Bad Thinking,’ author Rachel Toor argues that some problems with students’ writing arise from their belief that they must write like others in their fields—even when that writing is clumsy. Instead, Toor says, students should follow George Orwell’s and Strunk and White’s advice about thinking and writing clearly. She adds, ‘Call me simple-minded, call me anti-intellectual, but I believe that most poor scholarly writing is a result of bad habits, of learning tricks of the academic trade as a way to try to fit in. And it’s a result of lazy thinking.’ Law students’ exposure turgid judicial opinions may explain some of the problems they face in learning legal writing. Student Guide to Footnotes and Citations in Scholarly Writing. ≈ Comments Off on Student Guide to Footnotes and Citations in Scholarly Writing. Professor William Mock has authored an article meant to help students cite more sensibly. The article begins with welcome advice: ‘Not every proposition in a law review articles requires citation, nor does every footnote require cited authority.’ (And in case you’re worried already, that sentence has two footnotes in the orginal!). It is the kind of article that should be given to incoming law journal editorial boards to help student editors (and research assistants) understand the distinctions among different types of footnotes. You can share this link for students to download a copy of the paper from SSRN. (With students, we recommend giving the link rather than the document itself so that students will also learn how to do research on SSRN–a source that gives them information not found on Westlaw or Lexis or Bloomberg). If law journals adopt more sensible rules for citations rather than strict mathematical formulas (such as 1.8 pages of footnotes for each page of text), law reviews have a chance to increase their readability and usefulness to readers. Controlling Crowded Sentences. Shorter Is Not Always Better? ≈ Comments Off on Controlling Crowded Sentences. Shorter Is Not Always Better? In his recent article Controlling Crowded Sentences, rhetorician George Gopen shows how to make Gopen the most of stress positions. He starts with a sample thirty-six word sentence and then revises it six different ways. Some revisions are a bit longer than the original, but Gopen emphasizes that ‘I do not hold with those who advise ‘to make it better, make it shorter.’ Each revision has a different purpose: one places a person in a subordinate role, and another builds empathy for her. The article appeared in the spring 2014 issue of Litigation. Amazon And Other Firms Cited By OSHA For Worker’s Death. ≈ Comments Off on Amazon And Other Firms Cited By OSHA For Worker’s Death. An OSHA investigation into the death of a temporary worker at an Amazon fulfillment center in Avenel, N.J., has prompted the agency to cite five firms for safety violations. On Dec. 4, 2013, temporary worker Ronald Smith died after he was caught in between a conveyor system and crushed while performing sorting operations at the Amazon facility. Based on its investigation into the fatality, OSHA has cited five companies for serious violations, including the contractor responsible for operating the facility, and four temporary staffing agencies. . . .
Changes and Trends in Paralegal Education. A changing economic climate, emerging technologies and a global legal market have transformed the legal industry. In response to evolving market demands, paralegal educators and law firm managers are adapting school programs, continuing legal education courses and training policies to better prepare today’s paralegals for success in the workforce and in their careers. 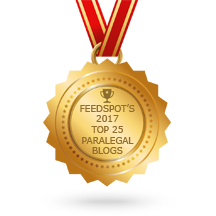 What skills sets are hot in today’s paralegal market? Paralegal educators, managers and recruiters across the country agree that a combination of strong technology, writing and communication skills, and hands-on experience will help paralegals excel in the workplace. Other hot trends in paralegal education and CLE include distance learning and a greater demand for certain paralegal specialties. . . .
Time To Take A Cue From Passenger-Friendly Court Rulings in UK? ≈ Comments Off on Time To Take A Cue From Passenger-Friendly Court Rulings in UK? On the heels of its recent passenger-friendly ruling in Huzar, a UK court again came down on the side of passengers, this time ruling that passengers have up to six years to bring claims for compensation for delayed or cancelled flights. EU Regulation 261/2004, which, among other things, entitles passengers to compensation from airlines for flight cancellations or significant delays, does not set a statute of limitations on those claims leaving those limits to be set by the implementing Member States. In the UK, cases for unpaid debts are subject to a six-year statute of limitations which the UK courts had been applying to 261/2004 compensation and delay claims. . . .
Sixty-One Legal Apps for iPhone and iPad. iOS apps for lawyers abound, whether for case management, billing, or trial preparation. This page has every legal app for iOS that we could find in the App Store. There are just a few exceptions. This does not include apps that have not been updated since 2011 and have few or no reviews in the App Store. Apps that are simply mobile versions of a legal publication aren’t here, either, since the app doesn’t do anything over and above the website. Finally, the App Store is full of applications that simply repackage freely available content, such as the Federal Rules of Civil Procedure. Unless an app added some significant extras (such as the ability to annotate or cross reference) to that type of content, it’s not here. The table below is searchable, and you can sort by each column. Use the comments to let us know if we missed an app, and look for an Android app catalog in the near future. . . .
What the Common Law Means and Why You Should Know. ≈ Comments Off on What the Common Law Means and Why You Should Know. Most nations today follow one of two major legal traditions: common law or civil law. The common law tradition emerged in England during the Middle Ages and was applied within British colonies across continents. The civil law tradition developed in continental Europe at the same time and was applied in the colonies of European imperial powers such as Spain and Portugal. Civil law was also adopted in the nineteenth and twentieth centuries by countries formerly possessing distinctive legal traditions, such as Russia and Japan, that sought to reform their legal systems in order to gain economic and political power comparable to that of Western European nation-states. To an American familiar with the terminology and process of our legal system, which is based on English common law, civil law systems can be unfamiliar and confusing. Even though England had many profound cultural ties to the rest of Europe in the Middle Ages, its legal tradition developed differently from that of the continent for a number of historical reasons, and one of the most fundamental ways in which they diverged was in the establishment of judicial decisions as the basis of common law and legislative decisions as the basis of civil law. Before looking at the history, let’s examine briefly what this means. . . .